The top victors in the 33rd annual LoToJa Classic are proof that weight, bad knees and even age can be overcome to win one of America’s coveted road titles. Forty-year-old Ira Sorensen (Millcreek Bicycles) took the group sprint to win the Men’s Pro 1-2-3s in 8:57:57 and 47-year-old Mary Emerson (TOSH) won the Women’s Pro 1-2-3s in 10:09:05 in a drag race to the line. Both are new to the sport. Sorensen, who is a Cat. 1 and an insurance agent from Herriman, Utah, started riding his wife’s $100 bike in 2009 after friends urged him to join them on a group ride. He was 70 pounds overweight, had no prior experience in sports, and “didn’t know any better.” But what he did soon know is that he loved to race a bicycle — and win. Emerson, who is a Cat. 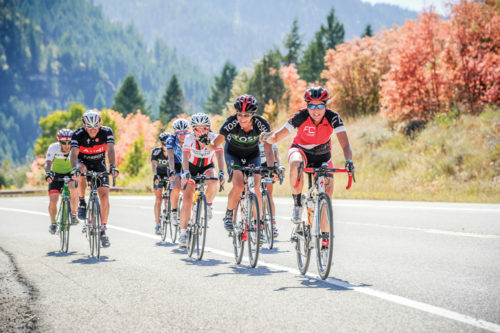 3 and a physical therapist from Sandy, Utah, turned to bicycle racing in 2011 because of painful knees and hips from years of basketball, volleyball and running. Yet, she was 43 then and thought, “I’m too old to race.” But she soon realized after some wins against younger riders that age can be meaningless on the bike. Sorensen said he wasn’t nervous on race morning when he rolled up to the start in front of Sunrise Cyclery on Sept. 12. He even visualized that he was going to win — although demands at his job kept him from serious training until March 1 and he had no teammates there. But in his favor, Sorensen knows LoToJa’s 206 mi/330 km parcours well. He has ridden the race every year since 2011, winning that first year as a Cat. 4 and again in 2012 as a Cat. 3-4. In 2013, he took sixth in the Pro Men’s 1-2-3s as a Cat. 3. And last year? That’s a hard one for him to forget. With only meters to go, three-time LoToJa champion and course-record setter Cameron Hoffman came around Sorensen at the line to win a fourth title. The memory of that loss rode with Sorensen as he and 18 other 1-2-3s pulled away from Logan at 6:06 a.m. and headed north under clear skies and a warm 50-degree morning. Also, at least for this year, there would be opportunity for Sorensen to erase and replace that memory. Hoffman wasn’t there to defend his title. He opted to ride the Master’s Nationals road race and criterium in Ogden, Utah that same weekend. He placed third and second in those races, respectively. 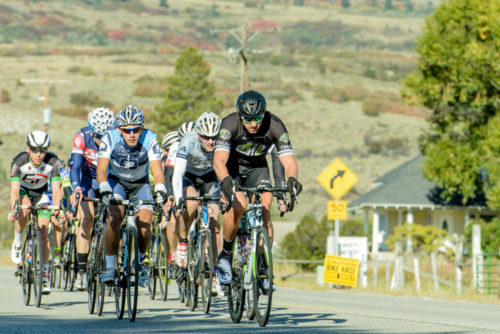 According to Sorensen, the pack stayed together in the darkness through Cache Valley, but before Preston (30mi/48km) David Miller (JHAF/Hoback Sports), Clint Mortley (Intermountain Livewell) and Coul Hill (Christian Cycling) got away. Mortley won LoToJa Men’s Pro 1-2-3 in 2013. The break remained as the peloton made the 22-mile climb to Strawberry/Emigration Canyon’s 7,424 foot-high summit (57mi/92km), the first of three ascents for the day. After the fast descent into Ovid, Sorensen and the pack pedaled on to the first feed zone at Montpelier (76mi/122km) and then began the nine-mile climb to 6,923 foot-high Geneva Summit (84mi/135km). Along the way, Chris Carr (Denver Fit Loft), a 2012 LoToJa Men’s Pro 1-2-3 winner, dropped his chain. But he caught back on at the U.S. Post Office in Geneva. Sorensen recalled that Carr was “irritated” at his misfortune and had to chase alone. With Miller, Mortley and Hill still up the road, the pack stayed together across the Idaho/Wyoming state line and on to the base of Salt River Pass (106mi/171km). Salt River is LoToJa’s highest summit at 7,630 feet high and features a 9-percent pitch during the last two miles. Just before the climb began, Sorensen said Will Hanson (Ski Utah/Plan 7) and Carr’s teammate Nathan West (Denver Fit Loft) rolled off the front. “My hands were tied,” said Sorensen. “I thought the race was over at that point.” At the start that morning, he and Hanson, both without teammates, had talked about helping each other against Denver Fit Loft and Intermountain Livewell. But two miles before the summit, Sorensen said Carr launched an attack and alarm bells went off. “I went with him and we dragged Chris Wyman (Pacific Premier Bank Cycling) with us,” he said. The trio caught Hanson and then Miller on the climb. At Alpine (156mi/251km) the group consisted of Carr, Hanson, Olson, Mortley, Miller, Wyman, Greg Krause (Groove Subaru Cycling) and Sorensen. But that didn’t work. After about 10 miles, Sorensen said he, Carr and Krause began to attack. Mortley was dropped, along with Miller and Wyman. Before the neutral feed zone at Hoback (178mi/286km) they caught Hanson. Sorensen said the group worked to break Cameron Hoffman’s course record of 8:45:38 while riding through Snake River Canyon. After Hoback, Carr and Krause attempted several attacks, but all were covered. But he hung on, even though the tempo increased with the finish in sight. At 1K to go, Carr jumped again. “At 400 to 500 meters, I got on his wheel and at 100 meters, I sling shot off his wheel,” said Sorensen. “I did exactly what Hoffman did to me last year.” Sorensen crossed the line at least three bike lengths ahead of Carr who finished one second back. Hanson took third at 8:57:59, followed by Krause and Olsen with the same time. Miller was next in sixth place at 9:03:53. All 19 cyclists in the Pro Men’s 1-2-3 category finished. It was also a big deal to win. After being beaten to the line by Hoffman last year, the victory was triumphant and emotional for him. Sorensen said he intends to defend his title in 2016. Also planning to come back next year is Women’s Pro 1,2,3 winner Emerson, who rode her first LoToJa in 2011 and finished in 12 hours. Last year she finished third in the 1,2,3s with a time of 10:09:09. She got all that and more. The combined Women’s Pro 1,2,3 and Women’s Cat. 4 peloton, left Logan with 48 riders at 7:12 a.m. and rode intact through Cache Valley and past Preston. While climbing to Strawberry/Emigration Canyon’s summit, Emerson and teammate Marci Kimball (TOSH) and Elana Alarcon (Boulder) dropped the field. About a half mile from the summit, Emerson got dropped too. But she didn’t panic. Which is exactly what happened. On the descent to Ovid, Emerson was caught by Cat. 4 riders Nan Doyal (VisionQuest), Kris Siudak (VisionQuest), Lisa Nelson (Team Fatty) and Ellie Hirshberg (TOSH). The five women then bridged to Kimball and Alarcon before Montpelier. Now seven, Emerson and the breakaway formed a pace line after Montpelier. Not wanting to get caught, they all got to work. The efficiency and cooperation between the riders impressed Emerson. “We shared water together,” she said. “The camaraderie was enjoyable and made for a special day. … Everyone did their part. There were no attacks. It was just a big group effort. While climbing Salt River Pass and watching Kimball take the QOM, Emerson knew the breakaway would stick until the final kilometers. It did through Star Valley and Snake River Canyon, and even up the last hill before South Loop Road. The cooperation even continued on Village Road. But with 3K to go, the pact suddenly vanished. With 2K to go, it was Alarcon, Kimball and Emerson at the front. Alarcon soon jumped and Emerson got on her wheel. At 1K Emerson came around Alarcon and burned everyone else off to the finish. Doyal crossed the line next at 10:09:09, followed by Alarcon at 10:09:09, Kimball also at 10:09:09, Siudak at 10:09:10, Hirshberg at 10:09:10 and Nelson at 10:09:28. The top three winners of the Pro 1,2,3s were Emerson, Alarcon and Kimball. The top three for the Cat. 4s were Doyal, Siudak and Nelson. Emerson explained the victory was important to her, but it was just as enjoyable to spend the day with six other women and share a common goal. But she also rode this year’s LoToJa for a fellow cyclist. Emerson dedicated her win to 2013 LoToJa stroke survivor Brian Hultman of Jackson, Wyoming. Hultman began this year’s race at the spot where the stroke hit him in Star Valley and rode to the finish with Dr. Steven Edgley, the University of Utah physician who treated him. Hultman was given a standing ovation at LoToJa’s award ceremony on Sept. 13. He has now started and finished LoToJa 10 times. More than 1,800 cyclists either raced or rode this year’s LoToJa. Seventeen licensed category pelotons and 16 cyclosportive groups left Sunrise Cyclery in six-minute intervals. LoToJa Race Director Brent Chambers said this year’s event was another success. Chambers added that work has already begun on next year’s LoToJa, which is scheduled for Saturday, September 10, 2016. The event is always held the first Saturday after Labor Day. The race director stressed that LoToJa would not be possible without the event’s loyal corps of volunteers and sponsors, nor without the working partnerships and support from all of the communities the race passes through every year. • LoToJa is the longest one-day USAC-sanctioned bicycle race in the United States. • It’s estimated more than 17,000 cyclists have pedaled over 4 million miles during LoToJa since the race began in 1983. • The oldest male cyclist to finish LoToJa was 74 and the oldest female was 63. • It’s estimated up to 15,000 calories are burned by each racing cyclist in LoToJa. • The 2015 LoToJa involved over 500 course volunteers — 150 are HAM radio operators providing radio communications and neutral support. 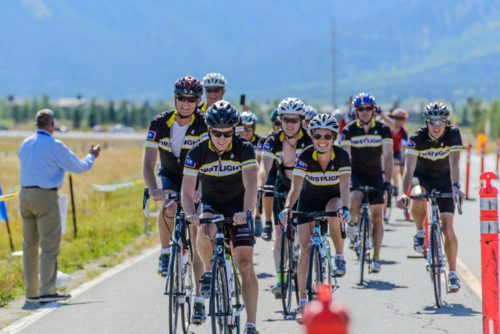 • In addition to helping HCF, LoToJa raised several thousand dollars for ASD Connections, National Ability Center, Common Ground Outdoor Adventures, Utah High School Cycling League as well as several community organizations and youth groups. • The first LoToJa Classic was held in September 1983. Seven cyclists left Sunrise Cyclery in Logan at dawn and raced to Jackson. The winner was Bob VanSlyke of Logan with a time just over nine hours. See results on page 16.